Photography has become so commonplace, ubiquitous, and off-hand that it can be hard to absorb the fact that once, once upon a time, it was new. 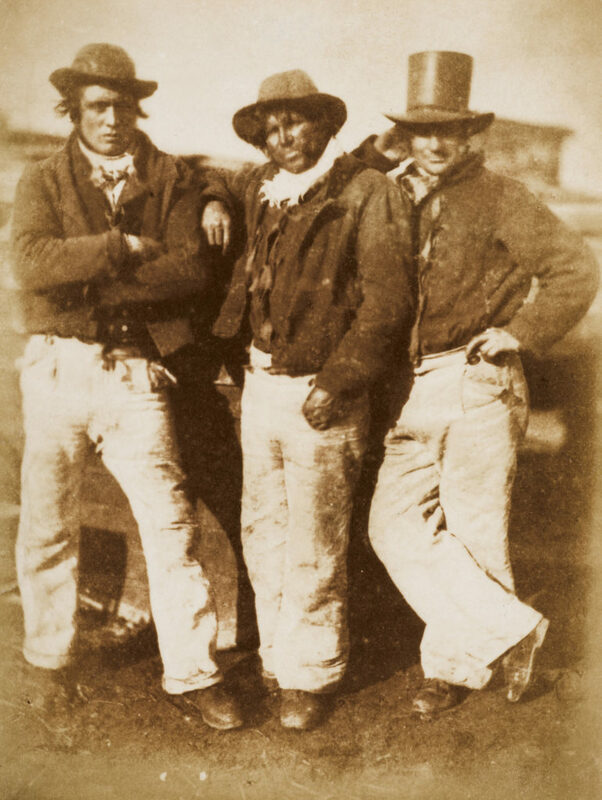 Salt & Silver: Early Photography, 1840-1860 is a reminder of that transformative moment. The exhibition, at the Yale Center for British Art from 28 June through 9 September (after which it can be seen at the Ruth Chandler Williamson Gallery in Claremont, California from 10 November through 23 December), presents over 100 images – all pristine, many rare, some unique – drawn from the archive of London’s Wilson Centre for Photography, and featuring more than forty of the medium’s most distinguished early practitioners. The exhibition takes its name from the salt print process – involving photographic paper sensitized with salt and silver nitrate – developed by the 19th-century English polymath William Henry Fox Talbot and introduced in 1839. 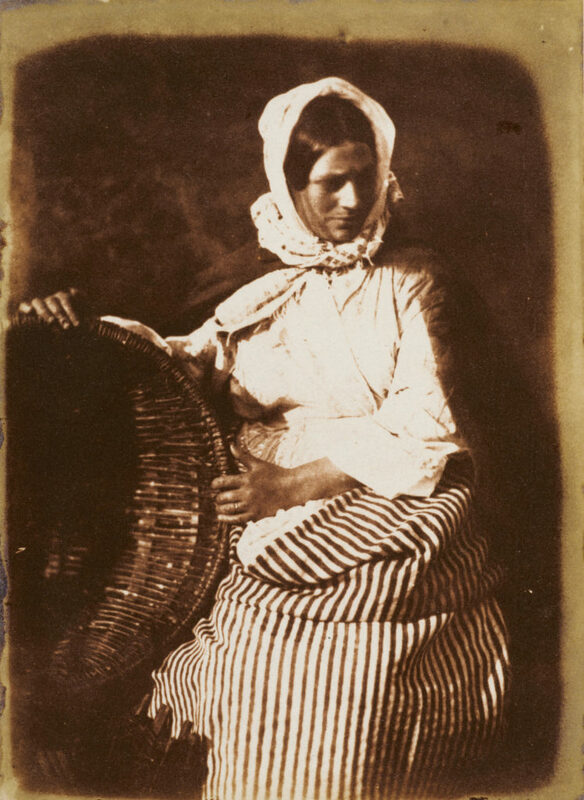 Whether or not Talbot was actually the inventor of photography, as curator Hope Kingsley stated on the day I visited the show (Nicéphore Niépce produced the oldest-known image in the late 1820s), his relatively uncomplicated, easy-to-master process helped to transform the new (and apparently even then irresistible) medium into an international practice that, over the roughly two decades surveyed by the exhibition, rapidly evolved both technically and aesthetically. The arrangement of the Yale galleries encourages the idea that early photography’s forward motion was as much geographical as artistic. 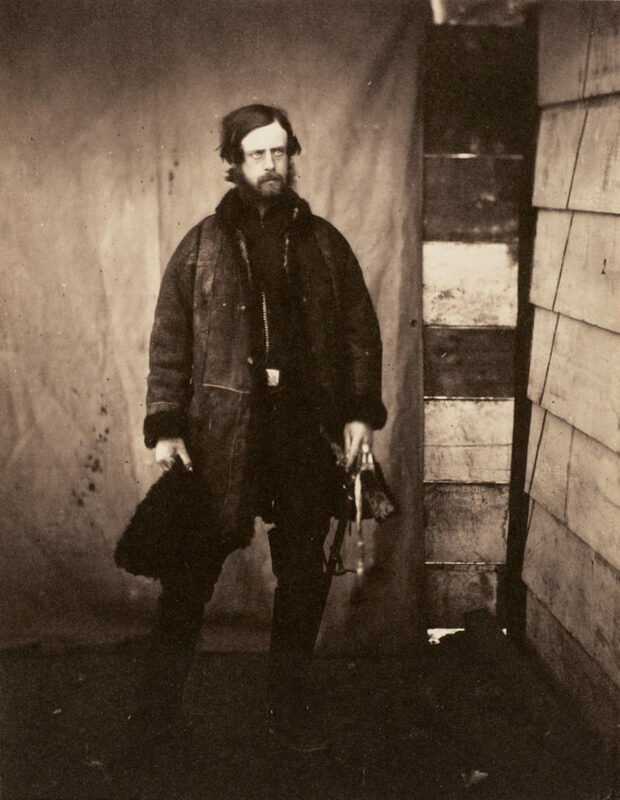 As Talbot’s velvety, expressionistic salt prints give way to the tonal depth and detailed precision of calotype, albumen, and wet collodion pictures, the narrative’s Anglo-centric origins begin an intercontinental drift, from the UK to Europe, then on to north Africa, the middle east, India, and the Americas. The journey reveals (among many treasures) Talbot’s own images and those of his circle; the team of David Hill and Robert Adamson, who alternated between social documentary and classical portraiture; the Crimean War photojournalism of Roger Fenton; stagy French nudes, one by the great Nadar; urban transformation and historic preservation, captured by Édouard-Denis Baldus, Gustave Le Gray, and the chronicler of Baron Haussmann’s Paris, Charles Marville; peregrinations through the highlights of ancient Egypt, the holy land, and the subcontinent, mixing tourism and imperialism; before finally arriving (by way of Mexico) at the cool Civil War tableaux of Matthew Brady. What struck me most about the show – other than the near-uniform, often haunting elegance of the images – is how many of the medium’s contemporary themes were present at the creation. Talbot’s picture of a page of ancient text reminds us that the capturing, preserving, and sharing of information did not begin with the iPhone. Side-by-side prints of Baldus’s Saint-Valéry (Vue du Port), printed via different processes, illustrate how technical manipulation can provoke a range of aesthetic effects. In Jean-Baptiste Frénet’s 1855 double portrait, a mother’s complexity of feeling toward her son – conveyed with nothing more than a look – starkly proclaims photography’s singular emotional expressiveness. 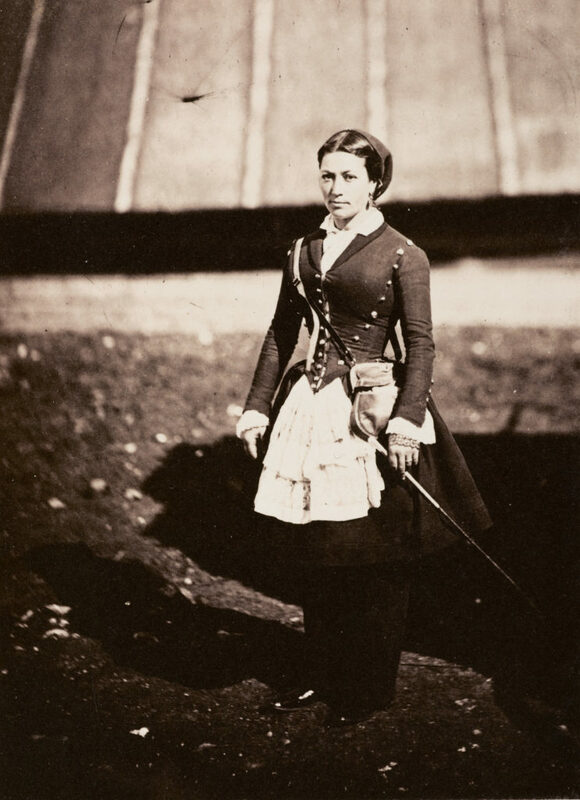 One of the show’s standouts, Fenton’s picture of a tough, ironic, surprisingly alluring Crimean War cantinière – fashionably attired and accessorized with a swagger stick – suggests the medium’s matchless ability to encourage narrative speculation. 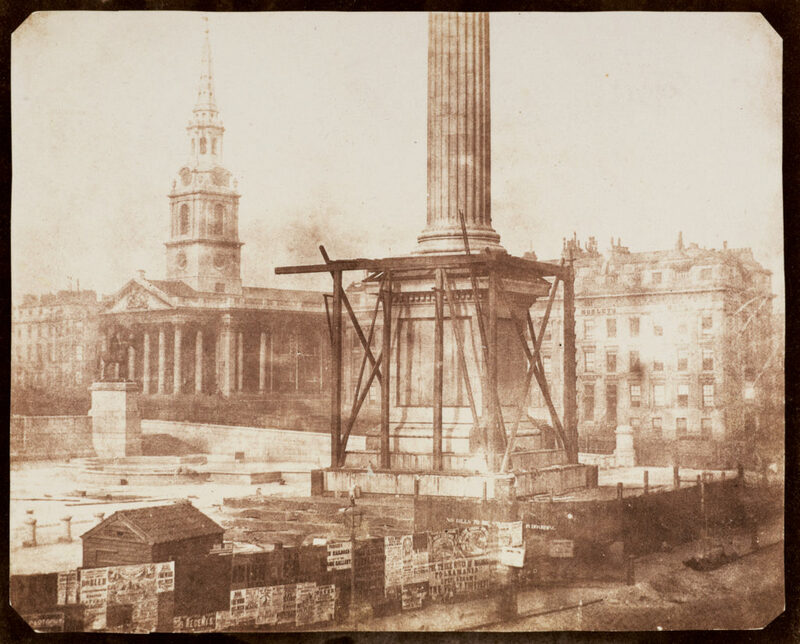 There are ‘current events,’ for example Talbot’s image of Nelson’s column under construction in Trafalgar Square, and – in Fenton’s Captain Lord Balgonie, believed to be the first photographic depiction of ‘shell shock’ – clinical documentation. 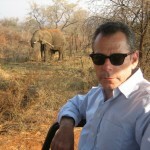 Perception vs. reality gets a workout: multiple ‘contemplative’ poses (hand on chin, downcast eyes, shoulder against stone wall) make one realize that people back then weren’t moodier, but exposure times were longer, and this was the best way to hold still. 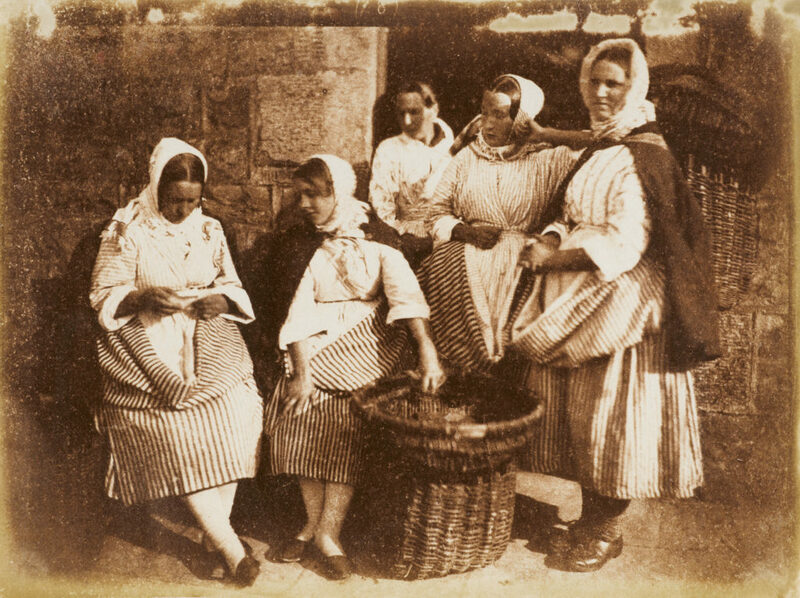 And then as now, as the great war photographer Eddie Adams put it, ‘Pictures lie’: two ‘takes’ of one of Hill and Adamson’s mid-1840s genre scenes, featuring fisherwomen in the Edinburgh district of Newhaven, reveal the image – seemingly artless – to have been carefully arranged. One of the pleasurable truths about ‘the shock of the new’ is that, no matter how much time passes, it never loses its original edge. So it is in the galleries at Yale. The world displayed in Salt & Silver has largely vanished. Yet the images still bristle with the power, fascination, and astonishing sense of moment that they conveyed when they were made.